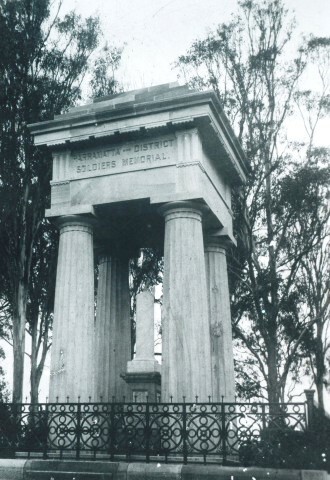 The Memorial to Parramatta’s involvement in the South African Boer War was unveiled 30 April 1904, by the Colonel James Burns, and Alderman William Noller along with J. Arundel and Walter Gates. Present at the ceremonies were Colonel Cox, who would ten years later garner even more fame in Palestine during World War One, Major Hiillard of the Lancer Regiment, Captain’s Mackenzie, Guyot and Dr. G. E. Rundle (father of the late Captain W. J. S. Rundle, of King’s School. Also there was the Honorable Joseph Cook and between four and five hundred public school cadets under Major Dove. Archdeacon Gunther conducted a short religious service, which included the singing of the hymn, “Onward Christian Soldiers” and “Soldiers of Christ Arise”. The memorial commemorated the actions of about 100 Lancers, including a number from Parramatta and district, who went to England at their own expense for six months training in Aldershot. The anti-British spirit and propaganda was in evidence in those days and opposition was made to the trip by the Government of that day. And later, when the detachment was on its way home it decided to land at Cape Town and take part in the South African War. The was some opposition from the Australian Government of the day and it made some attempts to stop the troops from landing and joining the fight. However the action was strongly supported in Parramatta and those who went away were promised a worthy memorial to keep them in remembrance. At the unveiling Sir Joseph Cook spoke of … the memorial as one of stately grandeur, and its massive pillars aptly represented and typified the strong support on which the Empire was based. The broken column stood for the broken lives of those who had died in the struggle in South Africa for the interests of the Empire. The Memorial was appropriate in every respect. F. J. Kilpatrick. Parramatta and Carlingford, N.S.W. lancers. Died of wounds on 16th January, 1900, at Slingersfontein. Corporal R. E. Harkus. Parramatta Post-office staff. Died, enteric fever, Bloemfontein, 4th April. 1900. Private Geo. Rawe. police. Parramatta. Mounted Infantry. Died, enteric fever. Bloemfontein, 11th May. 1900. Private J J. Kelly, Parramatta. Army Medical Corps. Died, enteric fever, Bloemfontein, 19th May, 1900. Trooper Les. D. Tunks. Parramatta North. N.S.W. Lancers. Died, enteric. Kronstadt, 2nd June. 1900. Private Les. C Hill, Parramatta. N.S.W. Lancer, Mounted Infantry. Died, enteric fever, Capetown, 21st June. 1900. Capt. W J. S. Rundle. D.S.O., Rooty Hill and King's School. Died 50th July, 1901, at "Karree Bosche," of wounds received at "Beaufort." Lieut. G. B. Foster, Parramatta and King's School. 2nd N.S.W. Mourned Rifles, killed in action at Tweedraal, 10th December, 1901. Trooper H. Drinkwater, Parramatta. Died, enteric fever, Capetown. 2nd February, 1901. Lance-Corporal A. E. Smith, killed at Vaalkop. 1901. By W. Hanson, Historical Memorials, Parramatta Historical Society, Journal and Proceedings, 1934.